To get Burger King’s customers into the Halloween holiday spirit, Hour One assisted BK’s Agency Of Record, David, to pull off the scariest thing a Burger King customer could encounter – a McDonald’s! 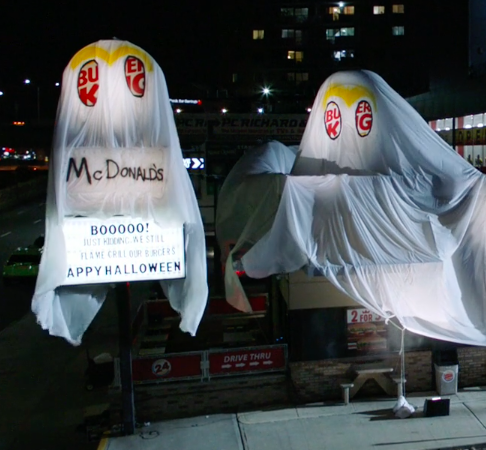 We dressed up a Burger King in Queens, NY as a spooky McDonald’s ghost and served Whoppers in McDonald’s-branded boxes making for some great consumer reactions. In addition to production, Hour One provided the social media and Influencer Marketing strategies. The success was astounding with 2 billion impressions across multiple channels. We engaged 50+ influencers and PR outlets to amplify the stunt. The reach surpassed all expected goals through key influencer selection and quick optimization.